You would think that winning the war (or at least having it won for you) was enough revenge for the humiliation the proud French motor racing industry suffered by those wretched silver cars in the years before Germany invaded Poland. But that's not acknowledging the amount of French pride that was hurt during the late thirties. It was all of it. Who cannot remember the sheer joy over the German defeat by René Dreyfus and the glorious Delahaye 145 at the 1938 Pau GP? And didn't the ACF rather have its main event run to sportscar regulations than having the French cars thrashed on home soil? Such was the heartache felt from the Lorraine to the Garonne. And so in 1946 France put in an all-out effort to grab the early advantage on a continent still dwindling from the war effort, most countries putting all of their resources into rebuilding their towns and their industries. So did the French, of course, but they reserved a small amount of money to create their national racing car. After all, the Mercedes and Auto Union onslaught had been backed by the Nazi regime and this seemed a recipe for success. Just months after the return of motor racing in the Bois de Boulogne the aptly named Centre d'Études Techniques de l'Automobile et du Cycle (Study Centre for Automobile and Bicycle Techniques), CTA in short, received a government grant to develop such an all-conquering French racing car. Albert Lory, of twenties Delage fame, was commissioned to design its engine, and a factory was set up in a former arsenal at Châtillon near Paris. The driver just had to be Raymond Sommer, the Coeur de Lion, the French hero responsible for winning that illustrious 1936 ACF GP for sportscars, along with that other French great, Jean-Pierre Wimille. It is no coincidence that the Reims grandstands were named after Sommer, Wimille and Benoist. At the same time, the Teutonic sound of Sommer's surname was conveniently overlooked. Lory created a 1.5-litre supercharged 90-degree V8 with a five-bearing crankshaft and two staggered cylinder banks cast in a block with non-detachable heads. The power of the engine was reportedly around 260bhp at 7500rpm, figures coming close to the almightly Alfetta voiturette. Sounds nice alright. So why was the car a failure? Well, look at it! How can a car sitting that high ever do well? Apart from that, the chassis was a simple ladder frame that badly handled the power that came from the slightly angled engine from which a propshaft underneath the driver led to a four-speed gearbox on the final drive. 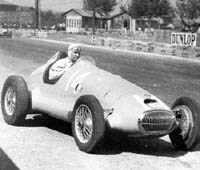 The chassis was so awful that the car couldn't hold a straight line at speed during the initial Montlhéry tests in early September 1947. Ah, so the results were indeed miserable? Oh yes! And the embarrassment came in spades, aided by the fact that the French government couldn't wait to see the car in action. Wouldn't you like to know where your money has gone? And there could not be any discussion over the timing of its debut. It simply had to be at the French GP at Lyon, scheduled relatively late that year but still far too soon for the men at the Châtillon arsenal - it would be just weeks after the car's first shakedown test. Of course this spelled disaster with a capital D. In qualifying the car was almost half a minute off the pace of pole man Henri Louveau in his Platè Maserati 4CL and Chiron's SFACS Ecurie France Talbot in second. In the end, just 18 cars of the 25 entered started the race, with 14 of them having set a practice time. Sommer was 13th on the grid, perhaps hoping to stay with some of the slower Delahayes. But while the race became a Louis Chiron benefit, it became Sommer's (and France's) nightmare: after the car's clutch seized on the starting grid, the engine broke its halfshaft at the moment Raymond released the pedal. The car did not even cross the startline… It was a startline embarrassment that was strikingly similar to the one Sommer had to endure three years later at the 1950 International Trophy, when he was left behind on the grid sitting at the wheel of another infamous contraption: the BRM Type 15. The Lyon appearance turned out to be the CTA-Arsenal's only start - that is, if its momentary movement off its starting position actually qualifies as one. Still, a second car was built with the plan to make up for all of it at the 1948 French GP at Reims. The cars were duly entered by CTA for Sommer and Eugène Martin but when it became clear that they would not stand a chance of running with the Talbots and the Gordinis, let alone come near the quartet of Alfa Romeo cars, they were withdrawn and put away for good. CTA then quickly got hold of a Maserati 4CM for Sommer to still take part in the event. But his hopes of a good result expired on lap 2, when his engine let go. Meanwhile, three of the four-strong Alfa armada strode majestically to an Alfa 1-2-3, several hiccups for designated winner Wimille notwithstanding. Direct or indirect State intervention has been a common feature of French racing since the 30s and still goes on today with the announced return of Government-owned Renault for 2002. It was not until the mid-sixties that succes was found when the efforts of state-owned Renault and private Matra and Ligier were directed, with government inducement, at the designing of F2, F3 cars, sportscars and engines with the financial involvement as sponsors of public oil giant Elf-Total and tobacco state-owned manufacturer Régie de Tabacs with the Gauloises and Gitanes brands, and in due time all these makers went successfully up to F1. Before that, it is a story of embarassing failures and bureaucratic stupidity. The SEFAC car and the Fonds de Course scheme in the 30s had not taught a single thing about this matter, if the monthly L'Action Automobile in its Jan. 1947 issue, published an editorial of title: "Le prestige de la course". Besides its importance for technical progress - it is written - car racing "offers another kind of attractiveness of the greatest importance: prestige. And prestige is associated with the word propaganda, so intimely related with the collective greatness of a nation." The editorial goes on in explaining how the Italians managed to take the upper hand in 1946 racing and makes a veritable call for help to the French government and the French people ending: "[racing] was useful and still will be useful to prestige and propaganda of the great nations, that are eager of progress and modernism. This is the case for France and it is the mission of the French people not to forget it." [my translation] Well, if this was the climate, it is not astonishing that the French government persevered in its grant policy, disregarding the existing realities such as Gordini or Talbot. The grant was awarded to a Centre d’Etudes Techniques de l’Automobile et du Cycle (C.T.A.) during the Winter of '46/'47 to design a new FA car. The chief designing task was given to Albert Lory, the author of a masterpiece: the 1926 Delage engine. The car was going to be called CTA-Arsenal, since the shop was set in a former arsenal at Châtillon, in the Paris banlieu. Lory designed an 8V 1.5 litres engine with two-stage supercharging. The engine gave a reasonable 270bhp and a theoretical figure of over 300bhp was expected. Pomeroy writes: "Whatever merits the engine could have had were obscured by chassis and transmission problems", to be fair not of Lory's design. Indeed, the car presented a quite high clearance from the ground and after Sommer's trial run at Monthléry in September 1947 it became clear that the chassis had to be redesigned: the car in fact could not hold a straight line when at speed. But pressure was such, that it was entered for the first after-war ACF Grand Prix at Lyons. The poor great Sommer went through the same nightmare as in the SEFAC in 1934, but this time the car went to the starting line, its recorded practice time being the slowest, 27" off pole-position man Louveau on a (not very fast) Platé Maserati. Even the weird FWD Meyrat Delahaye, driven by Varet, was a bit faster. The car never left the starting line: the clutch seized and, when Sommer was finally able to unblock the pedal, the power of the engine made a half-shaft snap. It is not known why the car (not a bad one in principle) did not get proper development, likely for lack of funds due to the vagaries of government subsidizing. Instead a second one was built, and Sommer and Giraud-Cabantous were entered for the 1948 GP de l'ACF at Reims. This time, after the first day of practice, the cars were withdrawn never to be seen afterwards. They ended up in Tony Lago's factory, to rot there for some years. It is said that Lago had bought them, whatever the reason, but it seems to this writer more likely that the shrewd Tony might have asked money for their parking. After SEFAC and CTA-Arsenal, it could be thought that Sommer should have known better about accepting to drive poorly developed cars; he went to Silverstone, instead, to "race" the 16V BRM in 1950. What happened there is history.